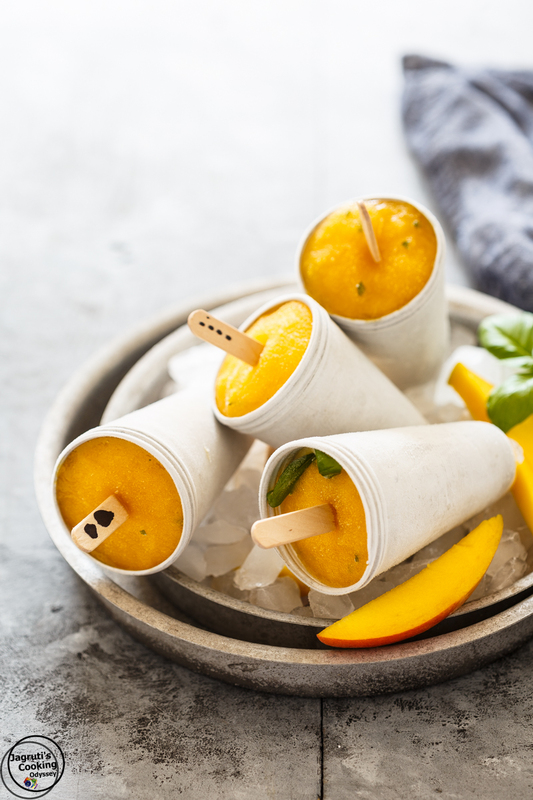 These Sugar-free Mango, Basil and Cashew Yogurt Popsicles are a great summertime treat, naturally sweetened with Medjool dates, which are homemade and so easy to prepare. 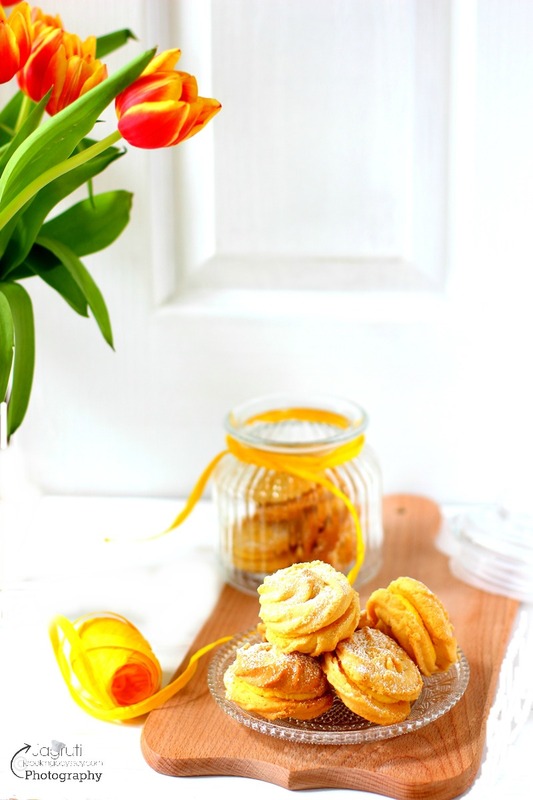 It is a light and delightful treat for anyone. You'll only need 5 ingredients and 5 minutes of your time. 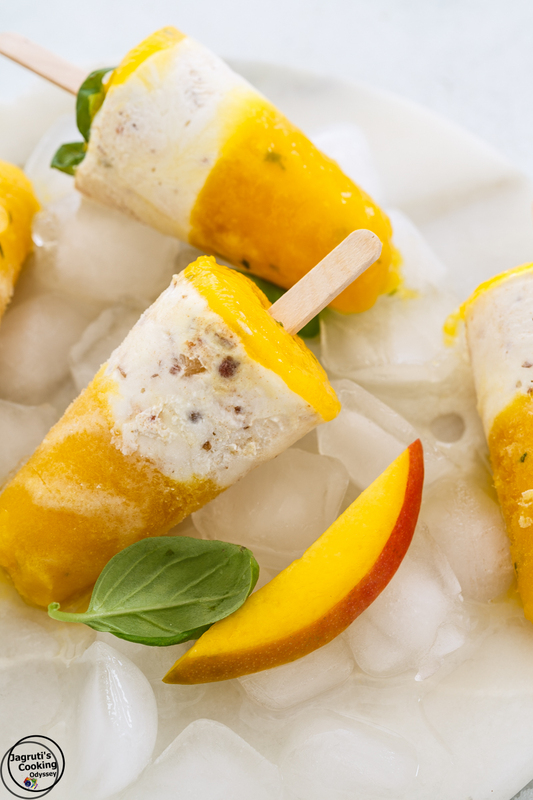 The basil brings out the freshness of the mangoes, and cashew yogurt provides creaminess. Prepare these and impress your friends and family even if you're not an expert in the kitchen. Great for a kids party or BBQ party. Even God admits that 'parents are the whole world, within them is the entire universe' let's say that you don't have to visit temples in search of God's blessings as blessings from parents are enough! It is a saying that 'Heaven lies at the feet of your Mother', and if Mother is heaven than the father is the gate of Heaven. Yes, the whole world admits and believe that no other human being in the universe can take place of a mother, but I would say exactly the same for Father too. Let's admit that Dad's are the unsung heroes. Although in a man's world women are not equal to men or they are not stronger and intelligent compared to men but having said that Mother's are respected all around the world, the power and influence of the mother in the society is clearly there. Maybe the world doesn't celebrate father's day with so much enthusiasm and give less attention than Mother's day, that doesn't mean we don't value dads or they are not important as mothers. You hear and see many stories about Mother's sacrifices, let me tell you that also fathers believe in sacrifices too. While I was growing up I've seen my both parents struggling, I've seen both of them carrying the insane burden to provide food, education and happiness to their children. About six months ago my dad left this world. throughout his life, he struggled a lot because of him being disabled, being too kind and generous and courageous. At the same time he was a fighter and above all, he was my hero. Today I won't talk more about his sacrifices, struggles or weaknesses because I have done that already here . Today I just want to tell you how beautiful our father-daughter bond was and how I still cherish those memories. When I was born, he cuddled me and said to the entire neighbourhood 'Laxmi ( Goddess ) has come to my home to bless me' and he went to town and bought small 24ct gold hoops, (hoops are still with me, and now it has been passed down to our daughter). When I was very young he would do my hair, feed me and take me to school as same time my mum used to attend college. In mid 70's he started working in Bollywood ( Bombay Film Industry ), he missed us a lot and we missed him dearly. Every 4-6 week he would come home with Mawa Cake, Bombay Ice and Golden Halwa and never ever forget to bring a little doll for his princess to play with, and while summer season comes a big wooden crate of Ratnagiri Alphonso mangoes. It was my dad who taught me how to eat the mango and that too, Alphonso. And while he would stay at home for a couple of weeks, almost every evening he would buy us ice creams, and this habit of his never went away, a few years back I took our daughter to India to see him, whenever we step out of the house he would give us 500 Rs and ask us to eat ice cream. Well, there is a one last moment which I had with him, I would like to share here. He came to drop me and my daughter off at the Ahmedabad airport, he wanted to give me 5000Rs, I said Dad, already you've given me so much and Indian Currency will be of no use to me as I have a direct flight to London. You know what he said' Please have an ice cream at the airport' 'Dad, Okay we will have it, but still I don't need 5000Rs,' 'Beta, I have heard that at the airport everything is so expensive' :) I took the money, yes we did enjoy ice cream and told him, that day everyone left the airport but he stayed until my flight took off. I still have 4,945 Rs change left with me. and yes, ice cream was expensive, it cost 5000Rs to my dad. For my dad, I was his world, I was the apple of his eyes. He was always worried about me and my family that sometimes I never told him if we were going through some hard times or feeling low. Unfortunately, I did not have any privilege to stay with him for a long time, first, he was working away from home, then my parent's separation happened and I got married at an early age and could not do much for him. But after I got married whenever I visited India, I made sure that I spent some quality time with and listened to all the stories he had to share with us, so whatever time we did spend together, it's priceless for me! Although his entire life was mostly focused on us, he didn't expect anything in return, being a man that he was and father he was, nothing but blessings came from him. He was a man with a heart of gold! I love you Dad, Forever. You are always in my heart! 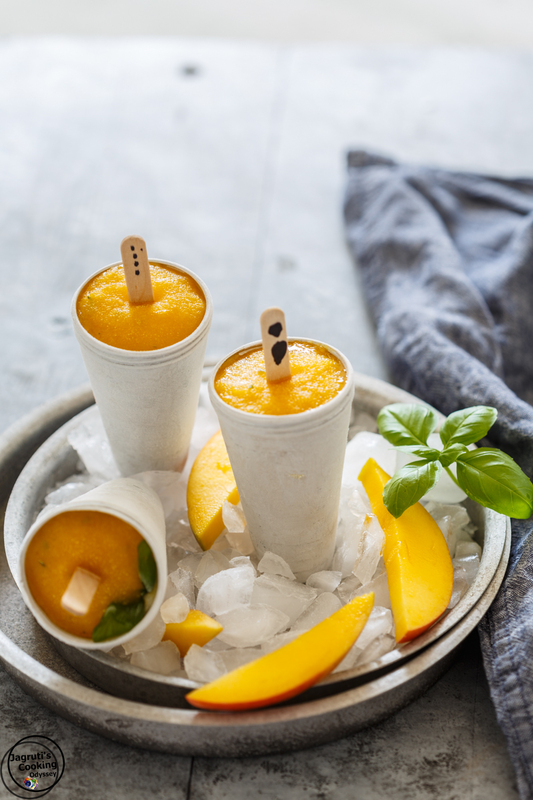 As a tribute to the memories of my dad, I am presenting a recipe which includes the Alphonso Mango and Ice Cream, both of which brought about a craze to me which started off early in my life by my dad, today all ice creams and Alphonso mangoes are my most favourite, the mango is known to be the king of all fruits and reminds me of the king in my life- My Dad. 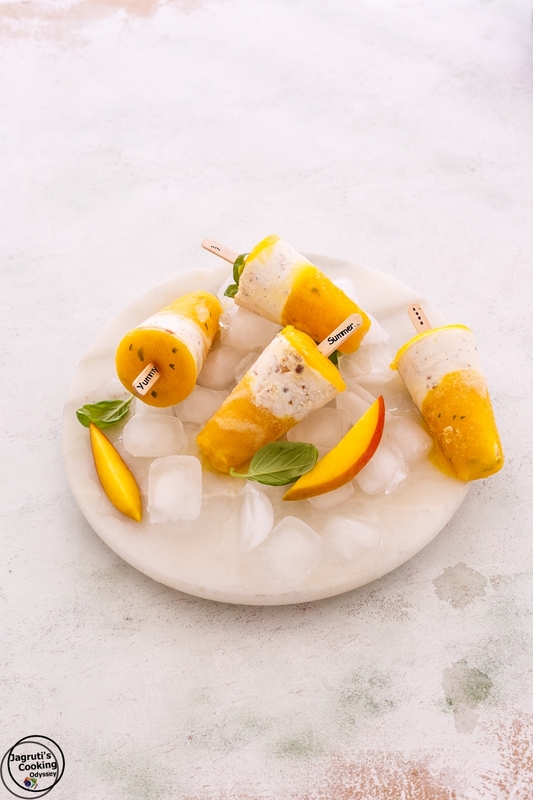 These naturally sweetened sugar-free Mango Basil & Cashew Yogurt Popsicle are refreshingly delicious, these are quick and easy to prepare. Can you believe that you only need 5 ingredients!!! 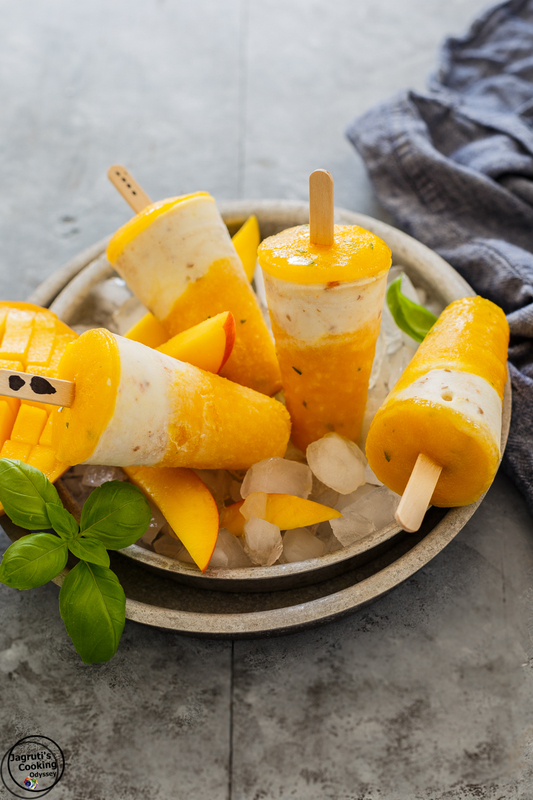 Combine mango cubes and basil leaves in a blender and mix until you have a smoothie like a mix. Meanwhile, add yogurt, cashews and dates in a blender and blend till you have a smoothie like a mix. Spoon the yogurt mixture and once again leave it in the freezer for 10 minutes. Now finish it off with the second layer of fruit. Pop in the wooden stick and freeze for at least four hours, or overnight. To remove the popsicles from the mould, run lukewarm water on the outside of them and remove it easily. If your mangoes are not sweet enough add maple syrup, Honey, Sugar or Agave Nectar. Again if you don't want to use dates use any of these above. Cashew adds good fat and bulks up a bit of protein in these popsicles, but again if you are not happy you can omit the cashews. Yum! 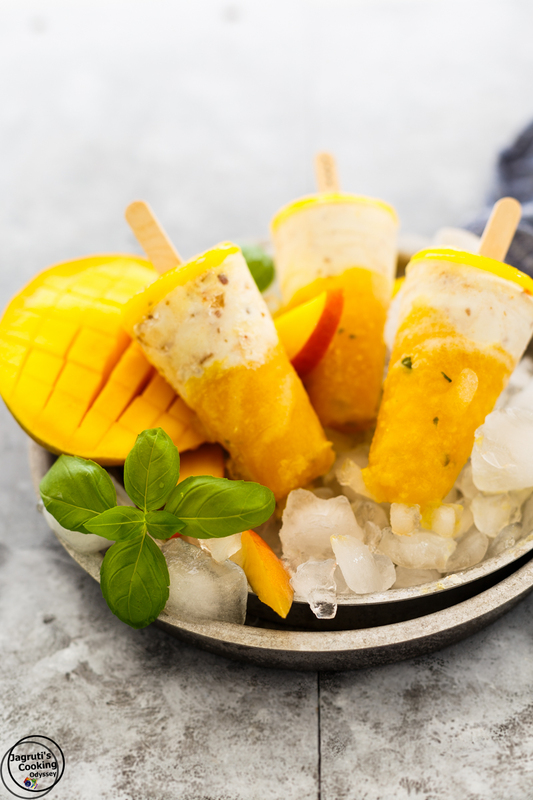 These look like the perfect frozen treat, especially with how warm it's been! 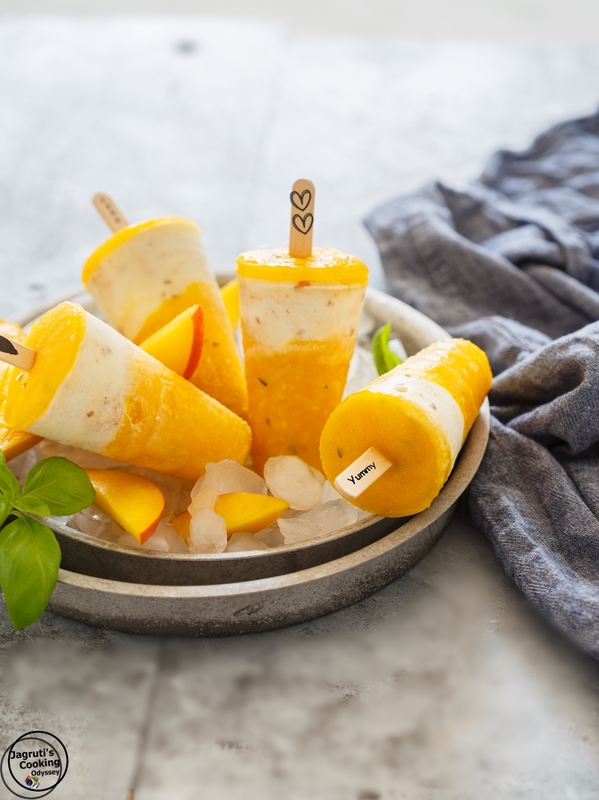 I love making frozen ice lollies with mango and yoghurt, remind me of lassi and of course, my favourite fruit in the world! I love that they are sugar free and a great use of my favorite fruit. I'm making these soon. Great tribute to your father and these popsicles look and sound delicious! I'm so sorry for the loss of your Dad! I am lucky that I still have mine because, like yours my Dad lives for his family and asks nothing in return! Thanks Binky :) Have a great time time with your dad. A beautiful tribute to your father Jagruti. They truly are the unsung heroes. Its the last memories we cling onto when loved ones leave us. 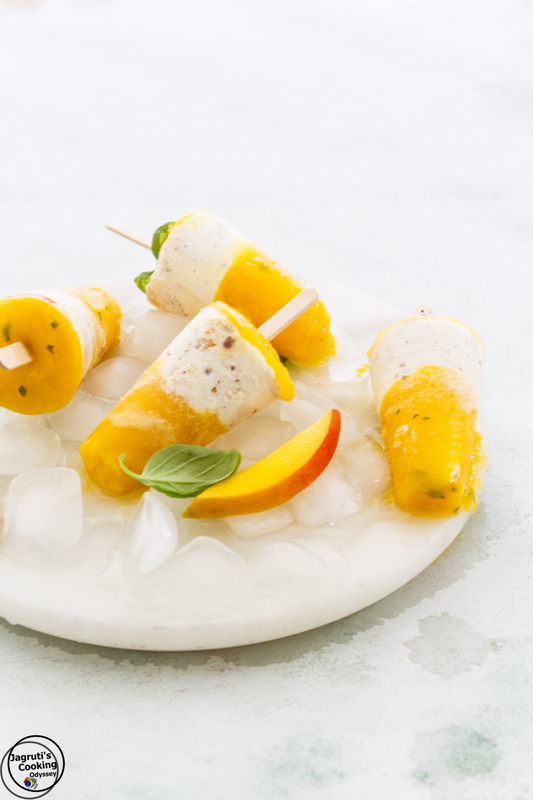 Love your sugar free mango, basil and cashew yogurt popsicles. Thank you Mayuri..have a great weekend. Thank you Tea and Catchup for this kind comment. We are having perfect weather to celebrate these Popsicle. Wow such a beautiful post..I was completely engrossed in reading about your dad. Good thay you have those 4945 left, just a reminder of him. Reminded me of few things. Hugs to you. Delicious ice cream will definitely try your version. Did you get the ice cream moulds from India or Uk, I am looking to buy this types, but India trip is not soon. Thanks Renu for the lovely comment. I brought those kulfi moulds from India, I think you can get here in UK too.